Hello again, all! It’s podcast time again, and this month I’ve got a two-part podcast (did you really think I’d be anything but longwinded? Moi?) answering more questions from readers and announcing the winners of the ASF Fourth Season Survey contest! The bulk of the episode (both parts — the second half will be posted on Jan 31) is devoted to questions related to how much I deviate from my plans, whether it’s due to reader feedback, external situations, or my own changing mind. In this first half, a multi-part question from Sara finds me ruminating on just how bad some of my initial instincts can be, why it’s important to be willing to change mid-storyline when I realize I’m making a big mistake, the weird way Ian and Danielle’s twisted relationship came about, and why Tristan nearly had an affair with–oops, no no no, that would be spoiling the podcast! 🙂 All in all you might be surprised to hear how certain major storylines could have ended up quite different from their final version… and thank heavens for all of us that they didn’t. Since Sara’s question had so many aspects to it… and because I really am crazy talkative… the second half of this episode will be posted separately. As always, the theme music is, of course, ASF’s own theme (from 2001 – 2012), “Hell’s Bells,” by Dennis M. Reed, as seen in our opening trailer. Thanks to Sara, and stay tuned for the second part of the episode coming up tomorrow! Please let me know what you think here or on the ASF Forum or on the Mailing List or just via email. Happy holidays, everyone! 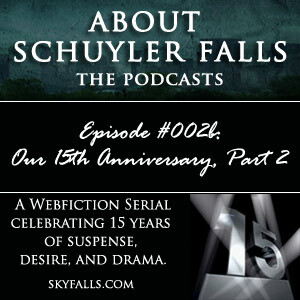 I’m delighted to present the first of a series of podcasts devoted to your questions and comments in response to ASF’s 15th anniversary and the end of our marathon fourth season. Originally this was supposed to be a one-part thing, but… well, you know me. And it’s your own darn fault for asking such great questions and making so many useful and interesting critiques and observations. It would’ve been churlish for me to just toss ’em off with a one-liner or two. And as I mention in the podcast, I really really did try to answer all questions at once. That episode rehearsal took nearly 4 hours. I mean, seriously. As enthralled as I’m sure you’ll all be by my voice, I couldn’t possibly hope to captivate you that much. Hi! I’ve decided to create a blog for episode commentaries (if I have any), any extra features such as articles about certain storylines, and any podcasts–in particular, the 15th anniversary podcast series I’ve created thanks to reader feedback and questions. I hope this will be an interesting experience and I won’t yammer on too much, but I am awfully wordy (as ASF readers know!) so let’s just keep our fingers crossed.